July may see days getting a little longer but it also tends to herald the worst of our winter weather. 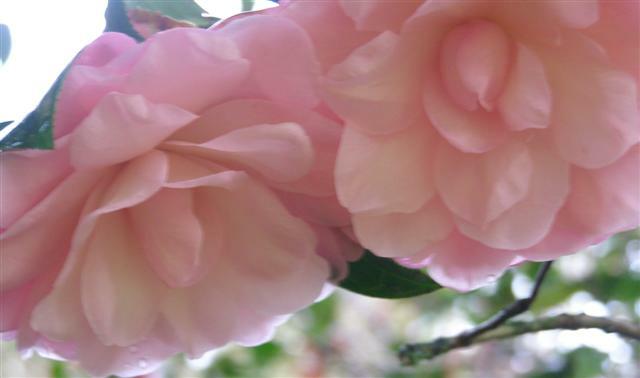 However as chill, grey days can be interspersed, as today and indeed, last weekend, with positively mild days when it is possible to garden comfortably and shed layers of clothing, the camellias flower on undeterred. The sasanquas are drawing to the end of their season but Elfin Rose, who opened her first blooms at the very end of March, is still a significant patch of lolly pink and dark forest green. Three months of flowering is better than most of the other sasanquas manage. 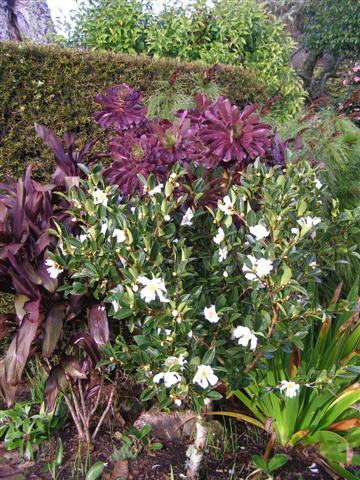 Silver Dollar also just gets better every year and is excelling with an extended flowering season. We think Silver Dollar, being lower and slower growing, would make a good hedge. Alas were it not for the wonderful shape and maturity of Mine No Yuki, it would have had the chop by now. It does not justify its place here as a flowering plant where the pristine white blooms turn to brown mush in our rains. The japonicas are just starting – the first flowers came on good old Waterlily, one of the first camellias named here by Felix. The original plant is pretty sizeable now – maybe six metres – but the early flowers are as lovely as ever. Half sister, Softly (another saluenensis hybrid) is also showing plenty of open bloom. In the class of pale formals, Softly shows good weather resistance. We went on a magnolia tour in northern Italy a few years ago and the timing coincided with the peak of their japonica display, and what a display. 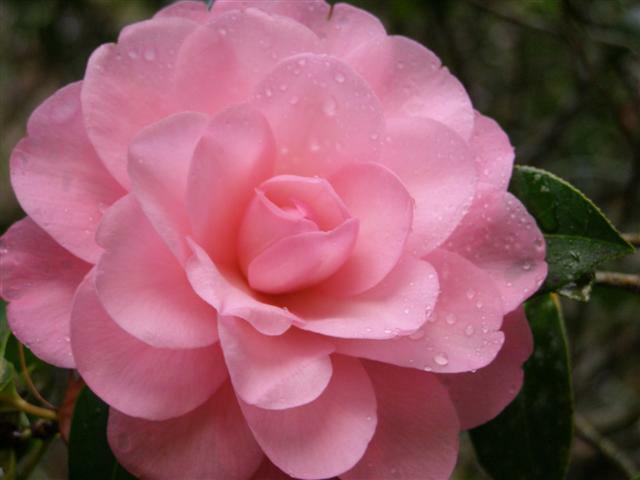 We soon worked out that camellias in that climate mass flower over a much shorter period of time. Here, ours flower for much longer but without that oomph all at once. In the species, C.gauchowensis is looking lovely but the star this week is the compact C.drupifera. Or maybe C.yuhsienensis. It is hard to decide – all look lovely with pristine white blooms. Yuhsienensis takes a bit of grooming to stay looking its best but it is such a lovely camellia. We have a row of about 50 plants in our open ground area which we are still debating about using as a hedge. Puniceiflora continues flowering – puny flowers but still with a simple, small charm. Alas I found the disconcerting sight of the first instance of the dreaded camellia petal blight at the very beginning of June (about June 2, from memory). It just seems to get earlier every year but it is not yet showing up badly on garden plants so I will return to the topic later when it is no longer possible to ignore it. 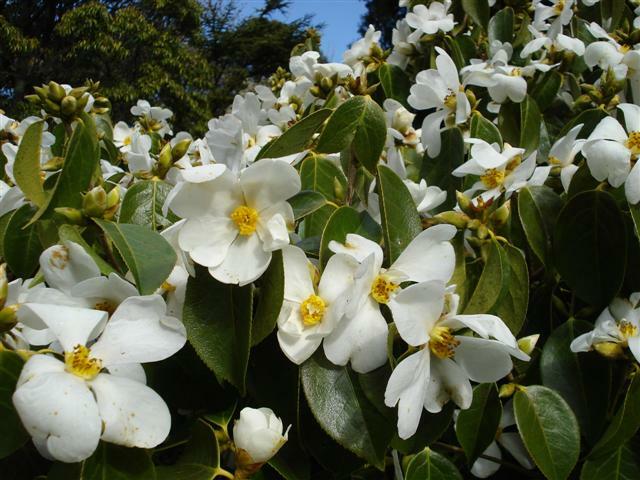 This entry was posted in Camellia diary and tagged Camellia drupifera, camellia species, Camellia Waterlily, Camellia yuhsienensis, Jury camellias, white flowered camellias on 3 July 2010 by Abbie Jury.